Disclosure: I am a member of MLF Connects program. As part of my participation in this program I have received compensation, however all opinions in place and ideas on this blog are my own. It’s been a long time since I’ve cooked with ground poultry. I’m not even really sure why because I do enjoy eating it and my family likes it! I guess because most of the recipes I’ve made have called for ground beef and I just never thought I could substitute ground chicken or turkey in its place! Now that it’s been re-introduced to me, I’ll definitely be using it more in our meals. It’s delicious! When I buy chicken breasts, I usually buy Maple Leaf Prime brand. I never realized they had ground poultry products. 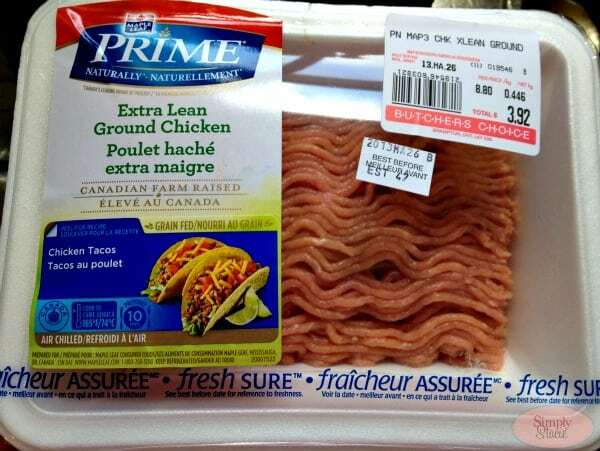 However, when I went out grocery shopping this past week, I discovered Maple Leaf Prime ground chicken in the meat section of Atlantic Superstore! How did I miss this before? In any case, now I know where to find it locally. Maple Leaf Prime Naturally Extra Lean Ground Chicken and Turkey can easily be substituted for ground beef as a healthier substitute. It’s low in trans fat and a good source of protein. It has the same texture as ground beef so would easily work in chili, spaghetti sauce, tacos, lasagna and more. If you are firing up the barbecue, try chicken or turkey burgers for something new. If you need inspiration, check out the recipes on the Maple Leaf Prime site. 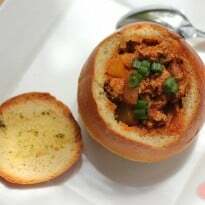 I found a recipe for Garlic Bread Bowl Chicken Sloppy Joes that looked easy to make and something my girls would eat. They quickly gobbled it up and didn’t even notice that the meat wasn’t beef! I actually preferred using the ground chicken over ground beef. The only things I changed in the recipe I made are leaving out the carrots and omitting the brown sugar. It makes for a hearty, filling meal. Do you cook with ground chicken or turkey? If so, what recipes do you make? You can eat this entire recipe, bowl and all! Preheat oven to 375ºF. Heat olive oil and butter in a large skillet over medium-high heat until butter is frothy. Add onion, celery and peppers. Cook 1 to 2 minutes until fragrant. Add garlic and cook 1 minute more. Add chicken and cook 8 to 10 minutes until meat is browned. Season with salt and pepper. Add chili powder, dry mustard, paprika, Worcestershire sauce and tomato paste. Stir to combine. Add balsamic vinegar, tomato sauce and chicken broth. Bring to a boil. Reduce heat and simmer for 15 minutes. Cut the tops of the bread rolls and hollow out the middle, using your fingers to pull out the excess bread. Brush the inside of the rolls and the soft side of the tops with melted garlic butter and place on a baking sheet. Bake in the preheated oven for 6 to 7 minutes or until lightly toasted. Note: the tops may toast quicker so check on them after about 4 minutes. 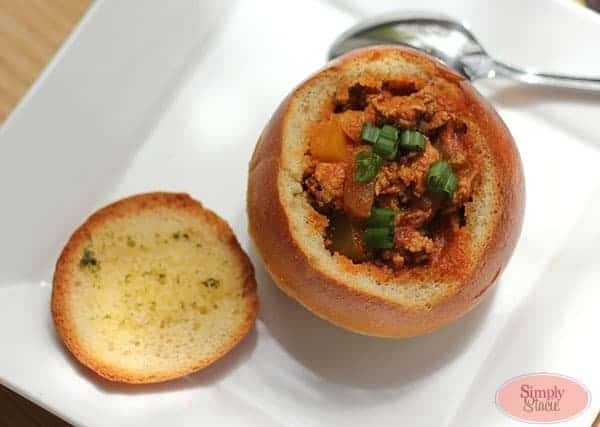 Spoon meat filling into the bread bowls. Sprinkle with cheese and green onions. 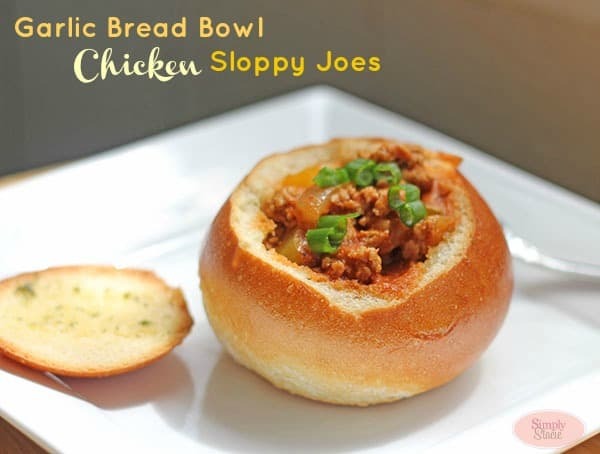 Place tops on bread bowls and serve immediately. I would make some turkey tacos for the family. I would make homemade hamburgers. I would add it to my spaghetti sauce. i’ll probably try the recipe you have in this post…its looks so yummy! Turkey tacos! I like them better than beef. Looks like a great meal for a cold & rainy night. Wow – just the Garlic Bread bowl looks great right now – I pinned! This looks soooo good!! Thank you for sharing!